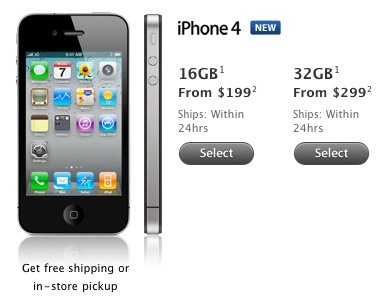 iPhone 4 Availability Now at 'Within 24 Hours' in U.S. Availability of the iPhone 4 continues to improve in the United States, with the company's online store now offering shipping estimates of "within 24 hours" for new orders. After spending much of the summer with three-week shipping estimates, supplies of the iPhone 4 began to increase in early October with a move to 5-7 business day shipping estimates. Estimates improved once again to 1-3 business days in recent weeks before making the final move to the minimum possible window today. iPhone 4 shipping estimates in many other countries, where the company is typically selling unlocked and/or unsubsidized phones online, are registering with estimates of up to two weeks for new orders.